Published by Cyril Huze May 14th, 2016	in Controls and Customs. 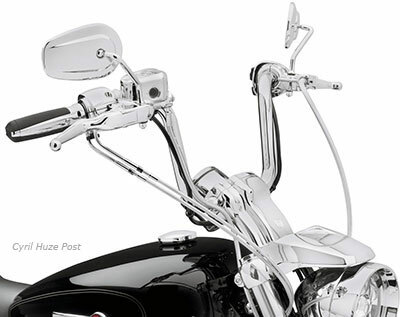 Designed specifically for riders who sit tall in the saddle, the new Sportster Tallboy Handlebar (P/N 55800580 Chrome, P/N 55800587 Gloss Black; $109.95) from Harley-Davidson® Genuine Motor Parts & Accessories enables long-armed riders to more comfortably fit and maneuver a Harley-Davidson Sportster® motorcycle. Designed by a panel of riders 5-feet 11-inches to 6-feet 4-inches tall, this handlebar measures 31 inches tip-to-tip and has 7.25 inches of rise to place the hands in a neutral position and reduce the bend at the elbow. This Tallboy handlebar fits 2007-later Sportster models, and installation requires the separate purchase of additional components. See an authorized Harley-Davidson dealer for fitment details. Looks nice and priced right.